When wood gets pressure-treated, it is infused with chemicals that protect it from insects and rot. 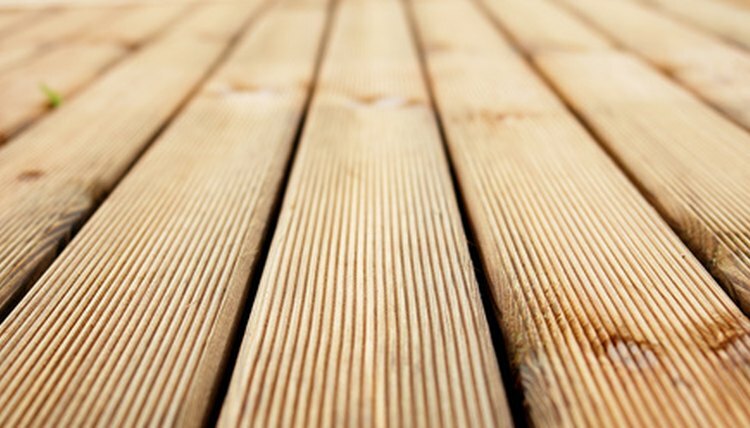 Because of its resistant nature, pressure-treated wood is used in many outdoor building projects like decks and walkways. For older pressure-treated lumber that contains arsenic, follow certain safety precautions to protect your pets. The pressure-treating process originated in the 1930s. The wood is placed into a large holding tank. The tank is depressurized and then the preservatives are added under high pressure. This process infuses the chemicals deep into the wood. The more preservatives that are placed into the wood, the higher pressure-treatment rating. With enough chemicals, wood can remain preserved even after being submerged in salt water for years. The most common chemical solution used to preserve wood was chromate copper arsenate, or CCA. CCA is dangerous because it contain arsenic, a known human carcinogen. Over time, the arsenic can leak out from inside the wood into the surrounding soil and onto the surface of the wood. From the surface, the arsenic can be picked up on the paws of passing pets, who later ingest it. If CCA treated wood is burned, the arsenic will remain in the ashes and mix in with the soil. In 2003, the lumber industry voluntarily stopped using CCA as a wood treatment option. Despite this stoppage, and since treated lumber lasts for years, there is still a large amount of outdoor woodwork that contains CCA-treated lumber. Rainwater or snowmelt will cause the arsenic in the wood to dissolve and come to the surface where your pets can ingest it. To prevent the water from reaching the arsenic, use a penetrating oil stain or sealer to protect the wood from water. Make sure that the stain or sealer that you use is recommended for use with pressure-treated wood. Wash the pet’s fur and paws after they spend time on a CCA pressure-treated deck. Don’t allow your pets into the space below the deck, since the arsenic is likely to pool below and contaminate the soil. Keep and eye on your pets while on CCA pressure-treated decks and don’t let them lick pools or puddles that have formed on the surface. If your deck always collects water in the same areas, drill small holes to allow the water to run out. If you decide to have the pressure-treated wood deck removed, there are certain precautions that you need to take to make sure that the area will remain safe for your pets. Keep pets inside while you are tearing down the deck as particles of the treated wood will be in the air. Make sure that you clean up the entire area and remove any sawdust or debris. If the deck was standing for a few years, the ground beneath it probably has some arsenic in it. Keep pets away from this area, or build another deck over it.